Like Sam Langford, the fighter he most admired, Joe Jeannette was barred from fighting for the heavyweight championship not for lack of skill but because of the color of his skin. Racism, promoters' fear of riots, and economic considerations made it nearly impossible for Black boxers to get bouts against top whites. Born in New Jersey, Jeannette learned to fight in street brawls as a youth. On a dare, he became a professional fighter at the age of 25. Jeannette quickly moved into the first rank of black heavyweights. Within two years of turning pro, Jeannette had fought Jack Johnson seven times, with one win, one loss, one draw, and four no-decisions. Because most of the white heavyweights of the day refused to face black fighters, black heavyweights were repeatedly matched against each other. Jeannette fought Langford fifteen times, resulting in a record of 3-6-2 with four no-decisions. He fought Sam McVey five times, with a record of 1-1-2 with one no-decision. Jeannette also fought multiple battles with Morris Harris (4), Black Bill (10), Battling Jim Johnson (9), and Hall of Famer Harry Wills (three no-decisions). Because the records for early black fighters are often incomplete or contradictory, it is quite possible that Jeannette actually faced these opponents many more times. Jeannette's most famous fight occurred on April 17, 1909, when he met McVey in Paris. The pair had fought a lackluster bout there two months before. The dissatisfied crowd had showered the ring with programs and other debris, and rumors began to circulate that the two had treated the fight as a mere exhibition. Eager to dispel that notion, Jeannette and McVey agreed to fight to the finish with no round limit. The resulting battle was one of the greatest marathons in boxing history. McVey scored the first of his 27 knockdowns in the first round. In the sixteenth McVey countered a Jeannette uppercut with a right to the jaw that most likely would have finished Jeannette-had he not been saved by the bell. Jeannette went down in the next round, the 21st time in seventeen rounds that he had hit the canvas. Looking beaten after nineteen rounds, Jeannette miraculously revived and seized control of the fight. As the bout moved past the 40-round mark, Jeannette began to floor McVey with regularity, but still could not put him away. In the 42nd, Jeannette dropped McVey seven times. Finally, after 49 rounds, McVey could not continue. Despite having been knocked down 27 times, Jeannette had triumphed in this unbelievable test of endurance, courage, and boxing ability. This fight underscores Jeannette's indomitable will. In one of his few bouts against a top-quality white opponent, Jeannette decisioned Hall of Famer Georges Carpentier in 1914 when the young European champ was only twenty. 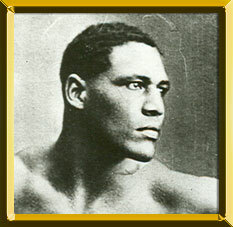 In later years, Jeannette lamented the fact that champion Jack Johnson refused to give him a title bout, saying, "Jack forgot about his old friends after he became champion and drew the color line against his own people." Jeannette continued to fight until his retirement in 1919 at the age of 40. While existing records credit him with slightly over 150 fights, Jeannette believed that he had actually fought about 400 times. After leaving the ring, he worked as a referee, operated a gym, and ran a limousine rental company.